HEAT olive oil in 2 quart pan over medium heat. 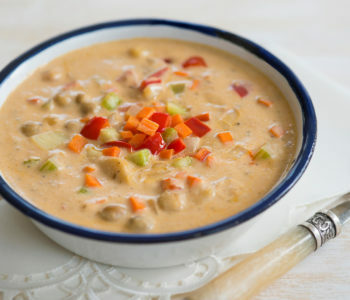 ADD garlic, onion, celery, red pepper, carrots and mushrooms to pan and simmer until onions are translucent. ADD flour to pan while consistently stirring for 3 minutes. 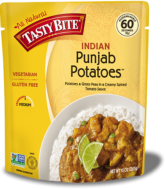 STIR in vegetable stock, half-and-half and Tasty Bite® Punjab Potatoes™ until mixture starts to simmer. SIMMER, uncovered, for 10 minutes. Season, as desired, with salt and pepper.